I know some of you have been waiting for me to get back to posting about my course on learning centers. I thank you for you patience. Just to do a quick recap, the course stated that there are five centers that all facilities should have. The first center I talked about was the block center, and then I discussed the art center. Today's center is the family center. This center can actually go by different names. I know during clean-up, I always say we have to get the kitchen cleaned up. 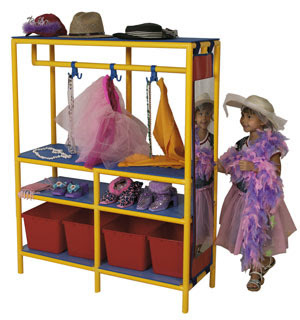 It is also called the dramatic play center, or the home center. I don't think there is a specific wrong or right name to call it, but we all know what it is. It's a place the children can associate with home. Right there is the reason all centers should have this family center. It should be a place where the children can associate with their own house. A place with a kitchen, table, clothes, maybe a rug, place to sit, children to take care of, phones to call friends, etc. It's there home away from home, and this will bring comfort to little ones that are not quite so sure of this "school" thing. When I read this post, I was like--"Ty Pennington, where are you now?" 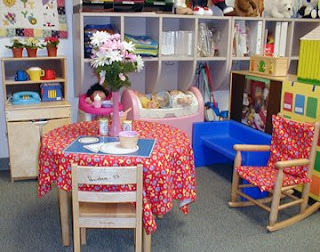 Ms. Maxine Edwards Cornwell, the author of the course, states that the family center should be a place with lots of color, warm colors and pastels: different textures, and soft surfaces. The area should have clear definition, meaning a certain place to go in, and go out. For example, some centers might use a little picket fence to define the area. This is where my imagination started to run away. I thought wow, I could get a little fence, buy some of the bulletin board type windows, get some furniture other than the table and chairs, a little rug, etc. The list went on and on. Then I checked the bank account. Well, one step at a time. If you are trying to set up a center, make sure you always check thrift stores or ask for parent donations, you may get some wonderful items. Ms. Cornwell also states that the family center should be free of worn-out, dingy, or broken items. When the clothes start to look haggard, it's time to replace them. We get many of our dress-up clothes from hand me downs, or the local Goodwill store. The same goes for the items. The food should look clean and inviting, the dishes respectable and unbroken. The dolls clean with plenty of clothing and bedding. At our school strollers and grocery carts are items that have to go on the sharing list. Everyone always wants one of these. It is also fun sometimes to use items in the center that can be representations. For example, maybe add some pebbles one day to symbolize food, or instead of having real flatware, something they can use to represent the flatware. This is where imagination really comes in handy. She states every center should have at least 10 hats, with different kinds. It's best to get washable hats and clean them whenever possible. Also, it's a good idea to add new items and put some items away. 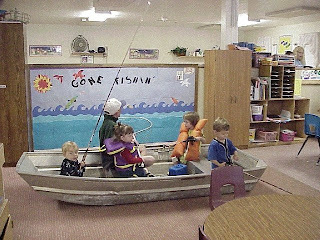 This brings about different aspects of play and exploration. For example, one teacher added a birthday cake for a while. Another teacher added a phone book--loved this. She took pictures of each of the children, plus put in pictures of common people we would call, doctor, veterinarian, plumber, pizza shop, etc. Next to each picture was a phone number the children would dial to reach this person. Another teacher added wrapping paper, scissors, and tape for a while. LOTS of skills going on here. One thing, that Ms. Cornwell states that should NOT be in the family center is a TV. Maybe a pretend TV that the children might make out of boxes, but not a real one. The television takes away from the whole purpose of having this dramatic play area. For the most part, this is a place for the children to experience everything they would experience at home with their family: doing dishes, cooking, folding clothes, taking care of others, going to work, wrapping presents, celebrating birthdays, reading books. If you do it at home, you should try to incorporate it here. Not everything always, but an introduction to all now and then. okay, i am going to start calling it the Family Center now. Or maybe Family Corner. I love it. Great post! Oh my goodness- that boat. How did they get it in there? My daughters still like to play house. It has been so cute seeing them roleplay as little mommies lately. They ask me for advice on how to hold the baby dolls properly etc. It's really sweet! Thank you! Great family center ideas... I love the boat.